The University of Suffolk is a transformational university, absorbing the best university traditions and aligning them with a twenty-first century audience and a modern world of employment and entrepreneurship. We are one of the newest universities in the UK; that means we don’t just rely on a heritage stretching back over many years but focus on making history every day. We pride ourselves on treating people as people, not numbers on an attendance register or admissions system. You will be on first name terms with your tutors and can expect lots of input and guidance from course leaders, who are experts in their field and often researching in the subject area you are interested in. We are proud that 94.4% of our graduates were in work or further study after six months, according to the Destination of Leavers from Higher Education (DLHE) Survey 2015. This high percentage of students in work of further study six months after graduating confirms the strong emphasis on employability and enterprise across all our degrees. Employability is not just about developing relevant skills, or getting a job; it is about your whole personal, academic and professional development. Studying at the University of Suffolk, you will have the opportunity to hone your personal strengths, and identify and work on your areas of development. All of our degrees enable you to get involved in problem solving, creative thinking, team working, delivering presentations and using digital technologies; all of which are essential skills needed in the world of employment. Many of our degree courses incorporate modules in professional practice, or graduate development programmes to enable you to put into practice your learning, engage with employers and outside organisations, and discover where your studies will take you in life. At the University of Suffolk, you’ll receive an exceptional education, richer and more rounded than many. This why we are proud to have been ranked the 22nd best university in the UK in the Whatuni Student Rankings as voted for by our own students. The people who matter the most. The rankings of 125 universities are based on a survey of over 25,000 university students from across the country. Our ranking means we are above internationally-renowned institutions such as Oxford and Cambridge. We also subsequently rank in the top 10 for Courses and Lecturers (5th), Accommodation (8th) and Student Support (8th). 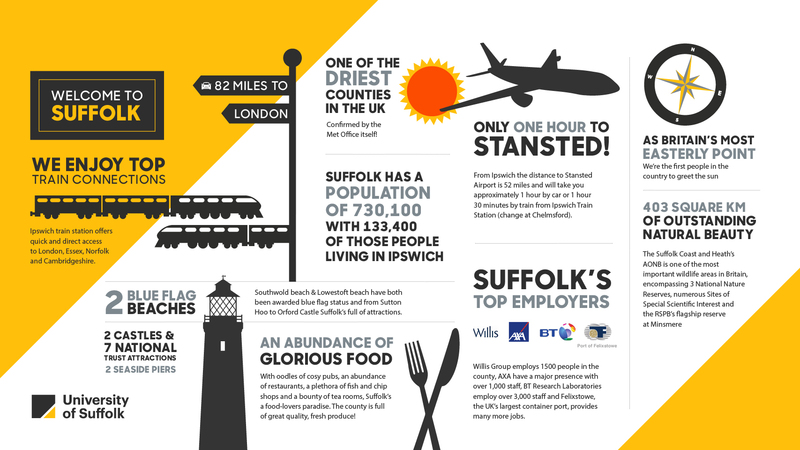 Take a look at what Aycan, first year BA (Hons) English student, loves most about living in Suffolk. Southwold is one of two Blue Flag beaches in Suffolk. Suffolk offers a rich and diverse cultural life, with bustling towns, thriving bars, restaurants and cafés, and an extensive arts scene. Suffolk is a county steeped in history, with beautiful scenery, world famous beaches and a glorious coastline, all within easy reach of London. Inspiration for artists Constable and Gainsborough, host to the annual Latitude and Pulse festivals, and weekend escape for famous faces wanting to get away from it all, Suffolk is the place to be. 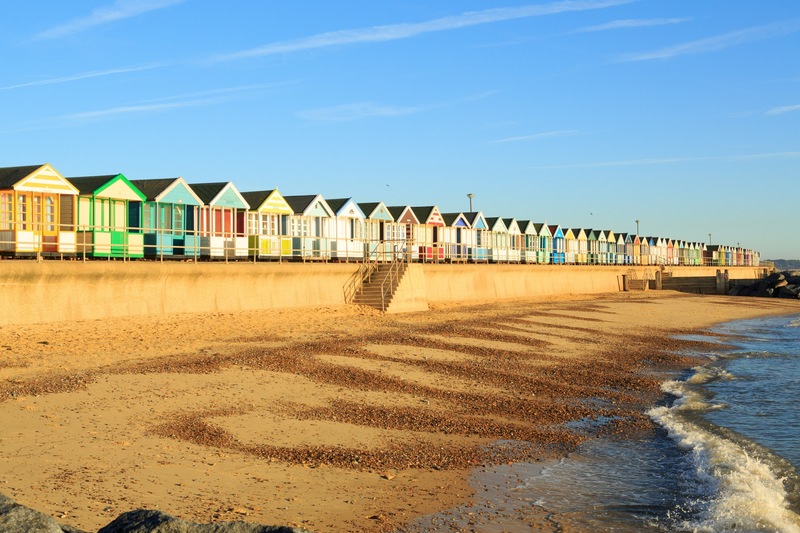 Known for its hospitable and friendly nature, Suffolk has a growing student community and provides a ‘home away from home’, with a mixture of dynamic urban centres, coastal resorts, and historic market towns. The University of Suffolk provide an ideal base to explore the beautiful surroundings of this exciting county. Suffolk is home to both international and local industry. Award winning UK brewer, Adnams, is located in Southwold and cider producer, Aspall, is based in Debenham, just outside Ipswich. As one of the fastest developing areas of urban regeneration in the UK, Suffolk is well positioned to benefit from the developing technologies in the energy arena and the growing tech cluster businesses rising in the county. Multinational companies such as AXA, BT, and Willis have also made their base here, charmed by the location and accessibility of the county to London, Cambridge and beyond.